A while ago we told you about Blazing the Trail, a new documentary by Peter Flynn about the American film company Kalem and the films it and associated companies made in Ireland 1910-1915. Now the documentary and eight surviving ‘O’Kalem’ films have been issued on a double DVD set by the Irish Film Institute and BIFF Productions. The O’Kalem Collection 1910-1915 comprises The Lad from Old Ireland (2 versions) (1910), Rory O’ More (1911), The Colleen Bawn (1911), You Remember Ellen (1912), His Mother (2 versions) (1912), For Ireland’s Sake (1914), Come Back to Erin (incomplete) (1914), Bold Emmett, Ireland’s Martyr (1915) and the feature-length documentary Blazing the Trail. The second DVD also contains an O’Kalem image gallery. Some of the films have replacement English titles as they only survive in foreign-titled versions. There is piano and violin accompaniment. O’Kalem was the nickname given to the Kalem filmmakers who made these tales of romance, rebellion and escape, which overturned all the crude stereotypes of stage Irish which had featured in films to that date. They were innovative in being American fiction film productions shot overseas, making handsome use of Kerry locations, and A Lad from Old Ireland was the first fiction film made in Ireland. O’Kalem means more than just the Kalem company itself. Its leading lights Sidney Olcott and Gene Gauntier stayed on in Ireland and filmed as the Gene Gauntier Feature Players (Come Back to Erin and For Ireland’s Sake) and the Olcott alone as Sid Films (Bold Emmett, Ireland’s Martyr). This is an important collection, for what it represents of Irish and early American cinema, and for the charming, fresh quality of the films. It has been lovingly put together and is warmly recommended (the delightful Blazing the Trail we have already praised – together they make make the ideal package). 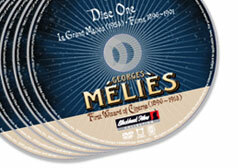 A 20-page booklet has also been produced. One fervently hopes that there will be American tourists heading over to Ireland in search of their roots who come home clutching a DVD of early cinema titles. All in all, enterprise has been shown to match that of the original O’Kalems. 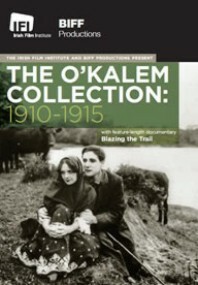 The O’Kalem Collection: 1910-1915 is available from the Irish Film Insitute as a multi-region NTSC 2-DVD set, price 21.99 euros, including postage and packing. Wonderful! Several of these feature the Australian-born J.P. McGowan. A tribute film to McGowan’s railroad productions in US was shown at Museum of Modern Art NY in April 2011.